J. Del Olmo Bridal Gallery is a father-daughter owned boutique that has been providing clients the finest in bridal and evening wear for almost ten years. We travel the nation and other parts of the world for unique fabrics, gowns and accessories. 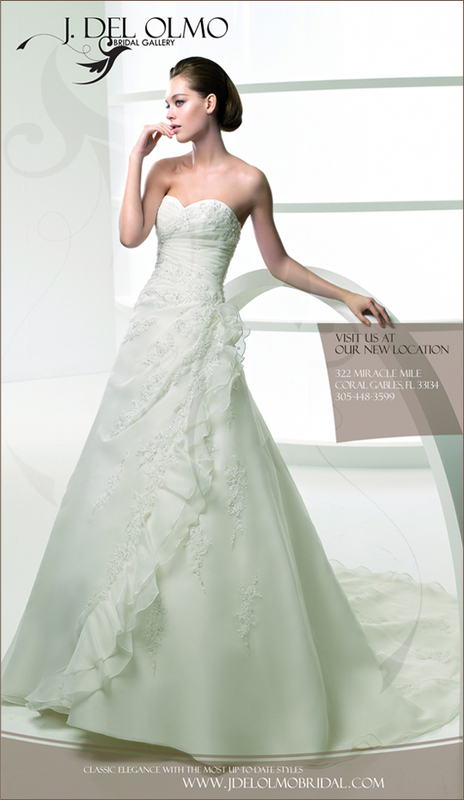 We carry a beautiful collection of bridal lines, including many from local South Florida designers. In addition to exquisite attire, we offer the additional services of alterations, gown cleaning and preservation. Our highly skilled in-house design team has the ability to customize any gown to make it your own. If you would like something more exclusive our designer, Joaquin Del Olmo, and our seamstresses can create the gown of your dreams with exquisite materials and hand embroidery if desired. At J. Del Olmo Bridal Gallery we are aware that weddings are one of the most important events in a woman’s life, this is why we hold our team to exceptional customer service from your first visit to the time you walk down the aisle. This holds true for any other special occasion including galas, proms, bar/bat mitzvahs, and first holy communions. Let the caring and courteous team at J. Del Olmo Bridal Gallery help you create your dream wedding or special occasion.